Note: 4 Restaurants are less than an 1/2 hour drive from Maggie Valley and Waynesville NC – several more about an hour away! North Carolina is a foodie paradise. 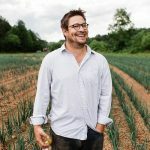 You’ll find inventive, unique and locally-sourced restaurants in Asheville, fine dining at the top of a mountain, and even amazing eateries located in unassuming small towns. Nearly everywhere in North Carolina is home to a few amazing restaurants. But with so many to choose from – how does one even choose? Well, these 25 are an absolute MUST TRY, guaranteed to give you that ‘once in a lifetime’ experience. Mateo appears on almost every food blog as one of the best restaurants in North Carolina. 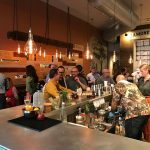 Mixing Spanish tapas with a southern touch…you’ll get the best of both worlds in this extremely trendy and delicious restaurant. Artisanal uses a farm-to-table approach sourcing the freshest local ingredients for tasty, unique dishes. Make sure to grab a table May-Nov when Artisanal is open. Set among the quaint downtown district of Davidson, Kindred came on the scene and quickly rose to fame. This ‘chef-driven’ restaurant has an ever-changing menu that focuses on seasonal ingredients. Located in an upscale hotel setting, Herons is perfect for a chic, five-star date night. Angus Barn is an amazing steakhouse in a unique location. If you’re looking for that perfect medium rare filet, go here! Exotic, creative, and unique cuisine awaits your taste buds in this rustic yet cozy farmhouse restaurant and hotel outside of Chapel Hill. Everyone deserves an elegant, five-star experience at least once. The Dining Room is perfect for that. All meat is farm-raised and the veggies come straight from the garden. 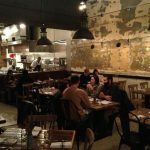 You might have seen Chef and the Farmer on PBS…but behind the scenes, this amazing restaurant is worth the 2-3 month wait. Chef and the Farmer is the perfect mix of subtle southern cuisine with a uniquely elegant approach. Snappy Lunch is half the experience and half the amazing food. You’ll get the Mayberry vibe with Andy Griffith regalia adorning the walls. But you MUST order a pork chop sandwich! If you’re looking for some of the best Eastern style Q in the state…B’s BBQ should be top of your list! Ryan’s is a steak with a view. Located amidst dense greenery, you’ll love the cozy setting. Ryan’s pairs delicious dishes with an extensive wine menu. It’s perfect for date night, celebrating with friends and family, or a Friday night out. You haven’t experienced high country dining until you’ve tried Gamekeeper. Specializing in a wide selection of game, this rustic mountain eatery is a mingling of elegance and Appalachia charm. The Copper Door is a quality steakhouse that won’t break your budget. Intimate yet rustic, it’s perfect for date night. Located in one of the oldest towns in the state, On the Square specializes in urban-inspired dishes minus the urban setting. Their fresh, ever-changing menu always offers something new. On the Square is a perfect mix of fine dining, yet comfortable and approachable. Located in the birthplace of Lexington BBQ, ‘the honemonk’ is THE place to stop for the best Lexington style Q.
There’s no denying Asheville is a foodie haven. One must-stop is Cúrate. Enjoy uniquely delicious spanish inspired tapas. On your next trip to the Crystal Coast…you must try Amos Mosquito’s. Everything (besides the ketchup) is made from scratch in-house or locally sourced. It’s a meal you won’t forget. Not to mention the waterside patio is perfect for summer nights. While Charlotte has plenty of amazing restaurants, you won’t mind driving to the suburbs to try Heritage. All ingredients are locally sourced and the plating is a pure work of art. Colington is consistently ranked as the number one dining spot on the Outer Banks. You’ll find it nestled beneath 300-year-old oak trees. Colington specializes in elegant dishes without sacrificing traditional, comfortable roots. Order up some fresh seafood and experience the best OBX has to offer. If you’re a lover of chicken and waffles, or just soulful southern comfort food…Dame’s should be top of your list. So much deliciousness! And for some of the best fried chicken you’ll ever have in your life…you have to visit the famous Price’s in the Queen City. This no-frills, straight up joint is like stepping back in time. There’s plenty of award-winning ‘burger restaurants’ in North Carolina…but the best one you’ll find in the state is at Johnson’s. For a restaurant with a view, River’s End is one of the best. 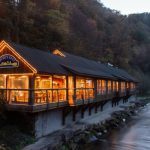 Located at the Nantahala Outdoor Center, each seat promises a riverside view.Enjoy classic breakfast dishes like Fontana Hash Browns, or a hearty lunch after a morning of kayaking. For some of the best vegan and vegetarian dishes you’ll find in the Tar Heel state…you have to try Fiction Kitchen. What did you think of our list? Did your favorite make the cut? Tell us in the comments!